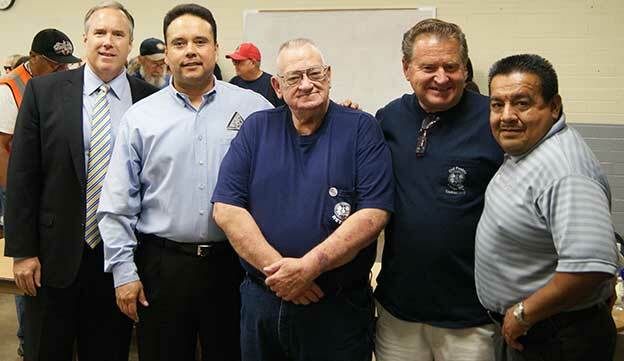 Attorney Robert Gregory, General Vice President Gary Allen, Local Lodge 933 retirees David Lillie and Mark Argraves, and Western Territory Chief of Staff Bobby Martinez. IAM Local 933 retirees at Raytheon Missile Systems in Tucson, AZ are celebrating their long battle for justice after finally receiving retirement funds totaling nearly $2.5 million. It was the long-awaited result of a class-action lawsuit against Raytheon, a multi-billion dollar American defense contractor that dragged out the legal process for almost 10 years. The dispute began in 2004 when Raytheon made unilateral changes to retirees’ healthcare benefits that were spelled out in the IAM/Raytheon agreement. On Jan. 22, 2013, a Ninth Circuit Court of Appeals hearing led to a settlement conference between the retirees and Raytheon which set the terms of the agreement. All retirees in the 2006 Alday v. Raytheon case were reimbursed by Raytheon 100 percent of the premiums paid after July 1, 2004 – the day when Raytheon began to breach the collective bargaining agreements that provided company-paid healthcare benefits for retirees and their spouses and dependents. The final settlement in the 2009 Greene v. Raytheon case has yet to be finalized with discussions between the parties currently underway. Special thanks to the class representatives for both lawsuits; including David Lillie, Ron Geuder, Mark Argraves, Keith Gross, Frank Greene, Clare L’Armee. Also a special thanks to retired Western Territory General Vice President Lee Pearson and all former and current members of the Executive Council and Grand Lodge staff who supported, and continue to support, this effort. The IAM’s Old Pueblo Lodge 933 has represented the hourly workforce at Raytheon Missile Systems/Hughes Aircraft since 1952. Click here to see photos of the IAM Local Lodge 933 celebration from the IAM Western Territory Flickr page.